Anxiety is a disorder that affects more than 40 million adults in the United States. Many people live their whole life with anxiety, never taking the proper steps to address it and care for themselves. However, it is actually incredibly common and is quickly becoming a topic that is being openly talked about. If you are looking for signs that you may be one of these people, below are 9 signs that you may have anxiety! Everything in your life seems to be a source of worry! You worry about your job, other’s perceptions of you, the well-being of family members, every-day tasks, and even things that haven’t even happened yet! Do you ever find yourself thinking about the future and creating scenarios of the way things will play out – even before they even happen? Your over-worrying actually interferes with your daily life. Your chronic worry actually makes you feel sick sometimes – overly-fatigued and weak. If your worry is negatively effecting your daily life, this is a key sign that you may be suffering with anxiety. …stomach pains, nausea, constipation, acid reflux, excess gas, bloating, UTI’s, etc. Anxiety and stress can seriously throw off your gut health! If you are unaware that you may be suffering from anxiety, you may start to believe that you have some serious medical condition that needs to be diagnosed! The problem is, the longer you leave your anxiety undiagnosed, your body will continue to have worsening symptoms. …picking your nails, talking to yourself, loudly tapping your fingers, shaking your legs up and down, randomly spacing out, etc. Have you ever noticed that when something makes you feel uncomfortable, you suddenly start dong some small, quirky habit. Something has triggered your anxiety and your body’s reaction to it is to pick back up that stress-related habit. Do you find yourself clenching your jaw, tightening your shoulders, and balling up your fists? Have you ever noticed that your whole body was completely tensed – and that has become the new norm? Muscle tension can cause a lot of health problems – one of the most common being severe headaches. If you notice that you are suffering from a tight, knotted neck or back, consider getting a deep tissue massage several times a month. This will encourage proper posture and help relieve the knots that may be causing your headaches. Daily, regular exercise is also a fantastic way to keep muscle tension under control. It is also a healthy way to help you handle your anxiety. 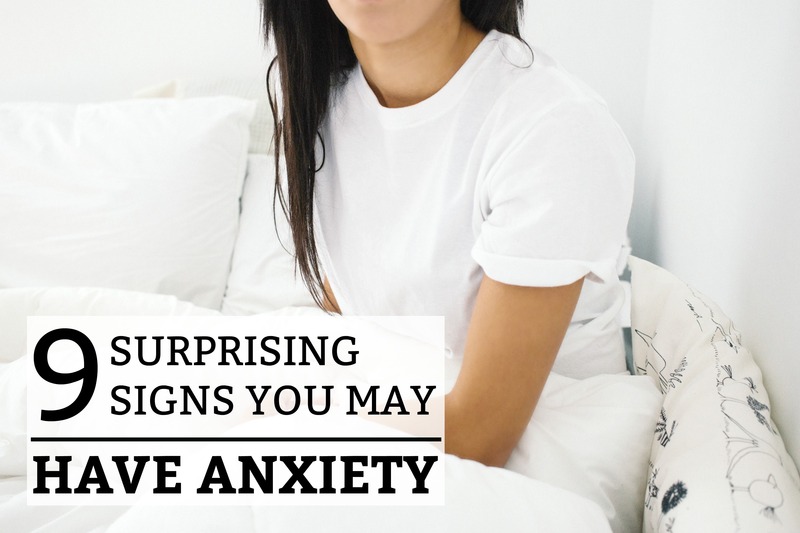 Your anxiety just got triggered – and your breathing pattern completely changes. Perhaps you start breathing only out of your mouth. Or maybe you start aggressively inhaling through your nose and exhaling through your mouth. Sometimes, your chest will tighten, your throat will close off, and it makes you feel like you aren’t breathing in enough air. If your breathing is starting to become a worry or obsession, this may be a sign of anxiety. Seeking professional help is an absolute necessity! No amount of online articles can cure an acute anxiety disorder. You may be having the most amazing, relaxing day of your life. And yet, your mind is thinking about everything that is concerning in life. It’s like your mind’s warning system will not turn off – EVER! You are always over-thinking everything in life that is coming up – whether it is stressful or not. Even if it isn’t supposed to stress you out, it does! You need to re-decorate everything! Your whole closet needs to get organized and a lot of items thrown out! You need to deep-clean your whole house or you will go crazy. Out of the blue, you absolutely need to do something – and you can’t get it out of your head! If you can’t accomplish what you want, you start to feel anxious and irritable. Although compulsive behavior is a common symptom of anxiety, it can actually trigger your anxiety and make it far worse. If you suffer from anxiety, you may find yourself constantly questioning yourself. Because of your worry and self-doubt, you constantly find the need to receive assurance and validation from other people. Are you making the right decision? Is your fear of something rational? Is your job performance satisfactory? Although it is completely natural for people to seek validation, anxiety often causes you to never feel like you have received enough validation! You find yourself constantly asking others if you are thinking rationally – even if you know it will only give you a sense of peace for a few minutes. Emotion is a normal response to stress and anxiety. Perhaps you have never been a crier, and suddenly, you find yourself crying about everything. If you are in a situation where you can’t cry (in public or at work), breath deeply and try to focus on something positive. If you need to cry, go ahead and cry! Sometimes, tears have a way of releasing built-up emotions. However, your body shouldn’t be exposed to long periods of stress or anxiety. You must find a healthy way to cope with it. Seek professional help. Find a healthy way to manage your anxiety. The problem with anxiety is that you may be completely unaware that you suffer with it! You consistently put yourself in mentally unhealthy situations that trigger your anxiety and send you unto a downward spiral. Discovering that you have an anxiety disorder is not accepting defeat or admitting that there is something wrong with you. The fact that 1 in 4 people have it should show you that it is completely normal and very treatable. Find ways to manage it and seek professional help if you know that you need additional resources. You are welcome, Mrs. Amoh! Take care of yourself. Anxiety is very common and there is an abundance of helpful information out there on how to remain mentally and physically strong, while struggling with anxiety. Take care, Caroline. Thank you for this article, I always wondered about the diagnosis I received from the Army psychologist saying I suffer from chronic anxiety disorder. But after reading this article it is very obvious that the diagnosis was extremely accurate. Is there ways to treat anxiety without medication? Good article. I have many of these and a few that are not here. My anxiety messes me all up, I don’t even want to go out in public. Thank you for taking the time to do this article. I think the admin of this site is really working hard for his web site, because here every stuff is quality based information.